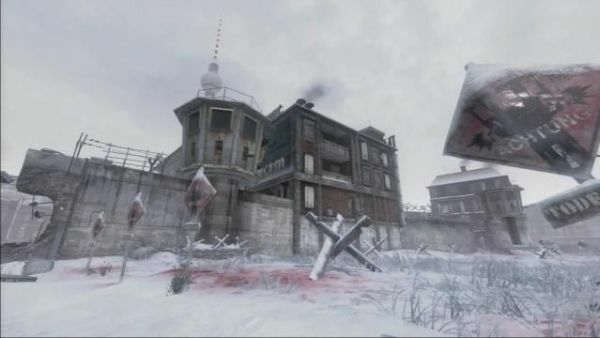 New maps are coming to Call of Duty: Black Ops, and zombies are coming with them. Well, one of them, anyway. Four new multiplayer versus maps will be available February 1st for the Xbox 360. The maps are titled Kowloon, Discover, Berlin Wall, and Stadium. For those of us who enjoy Combat Training, this will mean four new areas to comp stomp in. Of course, the bulk of gamers will be playing versus multiplayer, but I have the reflexes of a sedated yak, so I'll continue to blast away at bots in CT. This new video details each multiplayer map, but unfortunately doesn't mention anything about zombies, other than the title of the new zombie map: "Ascension." As for the multiplayer maps, looks like there will be zip lines, auto-turrets, and giant chasms for this go 'round. The devs also discuss how they want to bring more verticality to the game, along with more sniping opportunities. (This should please a few of my friends, who have also gotten older, and therefore also have the reflexes of intoxicated bovines. The only way they remain relevant in combat is to aim their high powered rifles at choke points from a safe distance, in the hopes that some idiot runs into the area, stops to look around, checks the mini map, and ties his shoes. Usually, I am that idiot.) The "First Strike" map pack will be available February 1st for 1200 MSP for the Xbox 360. PlayStation 3 and PC gamers can expect it at a later date, I'm guessing about a month later. Maybe by then PS3 users will actually be able to connect to a match. But I doubt it. Page created in 0.2505 seconds.